Turbospoke® products are designed and manufactured by Tomax Products Ltd., a Toy and Bicycle Accessory company setup in 2009, based in Ireland. 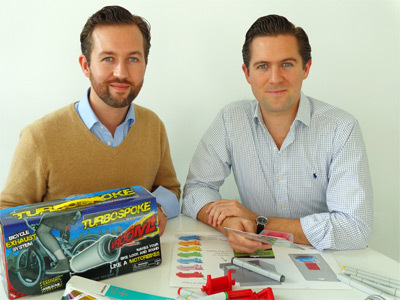 Tomax Products is run by brothers Tom and Andrew Maxwell, two guys with a real passion for anything with wheels. Since their earliest days these two gear heads have been playing around with cars and wheeled toys of all sorts. Anything with wheels, good sounds, speed…… you get the idea. As with all kids, the boys' bikes were their ‘wheels’. Their Dad had showed them the old trick of attaching a playing card to the rear of their bikes with a clothes pin to make that all important engine sound. This was a real hit with the boys, but naturally enough they wanted the sound to be louder and last for longer. And so the idea for the Turbospoke® Bicycle Exhaust System was born…..
Turbospoke® is now a range of awesome bicycle upgrades with new products coming on stream every season. Turbospoke® products are now available in over 25 countries, with multiple awards, over 45 million views on Youtube and the #1 Best Selling Kid's Bike Accessory spot on Amazon.com 2014, 2015, 2016. Strategic tie-ups with Raleigh® Hot Rod Bikes, and Hot Wheels® USA have further cemented Turbospoke®'s position as the #1 Kid's Bike Accessories Brand.